Beautiful! We've been looking at different color choices at Lowe's for our man cave, which one is this? The room looks so beautiful!! That is awesome that you were able to change the flooring for such a reasonable price! Thanks Lisa! Have a great day! Your floor and the farm letters look great. I love the whole room! That artwork with stripes and umbrella is really neat. ohhhh i was so happy to see a post from you and you sure didn't disappoint! that room should be in a magazine! you will love that floor...we had our den, dining room and hall done in engineered hardwood several years ago and that was one of the best decisions we ever made. only problem is dog hair (LOL)! I love it! Do you know the name of the flooring? I really love it! Ok, I may have to go look soon! The room really is beautiful! Diana, love the room and the flooring is so pretty. I love the windmill so great. Have a wonderful rest of the week. I always love seeing pictures of your home. The new floor is beautiful. Love it all but especially the rail road cart! Where is it from? This room looks amazing! Love the flooring and all your handmade accents! Just gorgeous!!! Well done! Did you install the floors yourself? Was it the kind of laminate that's flexible and comes in strips that's easy to install yourself? I looked at some the other day. It was $2.49/ft. omg, LOVE everything about this room....your one talented lady !!!!! I LOVE this room! Pinning now and following you on instagram! You have a gorgeous home! Your room looks great. The floors look awesome and it's great that you got the look you wanted for such a good price. Love the colours and the windmill is a really great piece. Oh my word! It looks so farmhouse chic. You nailed it!! amazing! where did you get that amazing couch? I just wanted to tell you that I have just discovered your blog and I love it! Your house is gorgeous, I'm so envious of all your terrific finds and furniture, and you have my dream job. You are a lucky woman! I have literally been perusing through your posts for an entire week and I am still finding great ideas and things I want to try in my own home. So much inspiration in one place! Keep up the beautiful work! Love it all! Absolutely gorgeous! We're trying to decide on new flooring right now too and the options are endless. I just love your style! Your home is beautiful. 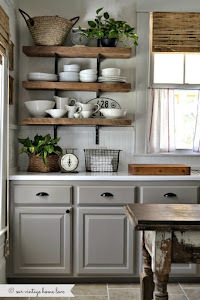 I love all the really cool ideas and especially the use of true rustic farmhouse things. Great job. Your room is beautiful, and so cozy! Could you tell me what laminate you used? I love the wide planks and the color. Such beautiful decor. I'm inspired! Where o where did your husband find that windmill...I love it!!! Where did you get your industrial cart coffee table? Where did you find the curtains in this room? I'm in love with them. Thanks!